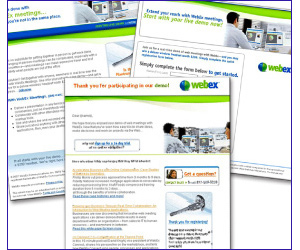 WebEx was running a high-concept national campaign themed around “Revolution”. Problem was, the concept did not translate into a satisfactory volume of leads when it was used to promote events and offers via email. Beasley Direct’s professional email marketing services team was asked to produce a new test focused on user benefits. Input from sales told us that if a prospect viewed a demo, they were much more likely to buy — and so we designed a campaign specifically to lure the prospect into the online demo, available 24/7. As a reward for responding, we tested a headset drawing vs. info premium vs. no premium. We had a hunch about the winner, but we thought we should test and verify it. Our suspicions were right and now we’re rolling out the winner to a much larger audience.